This article was reprinted with the permission of AIAA Aerospace America. Aerospace America, Vol.47, No.4, pp.20-22, Apr. 2009. Translated by Dr. Takashi Iida. This article was reprinted with the permission of Aerospace America. Aerospace America, Vol. 47, No. 4, Apr. 2009. Translated by Dr. Takao Ueda. Demand on high quality of medical and healthcare services motivates the research and development activities on medical information and communications technology (MICT). Among various MICT, body area network (BAN) is expected to be able to introduce more efficiency into medical and healthcare and improve the quality of medical treatment and healthcare management. By combining with bio-signal sensors, BAN can collect and forward vital bio-signal through dependable networks with high security and high reliability for real-time monitoring. There are many infrastructures can be used to forward BAN data to a central hospital for evaluation purpose including fiber-based internet, mobile cellular network (MCN), and satellite network. Satellite network has several distinct characteristics in comparison to the others. This paper describes an experimental system, in which BAN data is forwarded using Ka-band satellite. 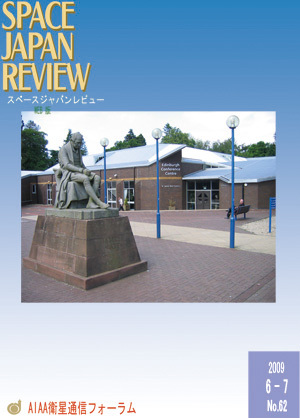 Mr. Arimoto reports the International Communications Satellite Systems Conference (ICSSC2009) of AIAA that had been held in the capital Edinburgh in Scotland from 1st to 4th in June, 2009. After the introduction of the conference, AIAA Technical Committee for Communication Satellite (TCCS) meeting held on June 1 is reported. The general meeting 2009 of AIAA Japan Forum on Satellite Communications (JFSC) was held on May 15, 2009 in the Akihabara satellite campus of the Tokyo Metropolitan University. Prof. Hajime Fukuchi, the Tokyo Metropolitan University, who is also the secretary-general of JFSC, report the general meeting, in which activity report 2008, fiscal report, auditing reporting, activity plan, budget planning etc. were discussed. In 2011, AIAA-ICSSC will be held in Japan.